Gopichand was a prolific writer. He wrote ten novels, twelve plays, numerous essays, sketches and letters. Though his novels are successful and his essays thought-provoking, he is remembered chiefly for his short stories. He wrote about a hundred short stories. Gopichand had his own ideas on this genre. In his view, the shape of the short story could be different depending on which of the main elements theme, plot, and character is given importance. If characterisation is predominant, a story becomes a ‘sketch.’ In some of his stories plot is replaced by a progression of thought. Gopichand’s stories fall into four broad categories: political, social, domestic and autobiographical. In the first type, he shows his awareness of the ideologies and functioning of several political parties. His stories illustrate how some families have come to grief and how their finer qualities are eroded by political involvement. A sensitive schoolboy is driven to Communism because his curiosity is suppressed by his domineering uncle (Peeditha Hrudayam). The reckless idealism of political activists figures in Pitrarjitham. Another story, Vamka, satirises the rivalry of the political parties which speak and act in the name of the people. An entire family is so deeply engrossed in politics that it neglects elementary courtesy to a guest (Bassu Agindi—Bassu Poyindi). Social problems such as the effects of poverty, injustices in free hospitals, petty tyrannies, usury, beggary, miserliness and blackmail are dealt with in a score of stories. Dharmasupatri depicts in a poignant manner how Paparao who visits a free hospital for an eye operation becomes totally blind due to the callousness of the doctor. Sham shows the perverted sense of values of a miser, Kotireddi. Utter penury forces an old rickshaw-puller to carry two insensitive men resulting in his death, in Kalala Baruvu. Respectable neighbors quarrel over petty things egged on by their wives and children because of jealousy in Irugu—Porugu. Religious bigotry consumes the idealism of a Hindu boy and a Muslim girl in Rendu Hridayalu — Nindu Hridayalu. The sins of a cruel money-lender, Surayya, are visited on his family in Dharma Vaddi, Gopichand attempts a Freudian analysis of maternal affection in Matru Prema, according to which much of the unpleasantness and friction in our homes is due to the attitude of women who consider their daughters-in-law to be thieves snatching away their rightful property, their sons. Begging as a social evil is attacked in Bhuta Daya. It is sustained by well-meaning and charitable people who may not be aware that the beggars deliberately and inhumanly blind children to evoke the sym­pathy of the passersby. Gopichand is adept at describing the domestic scenes and its many frictions. The attractions and the tensions between a husband and wife, the pitfalls of love marriages, the prudery of men, the double standards of morality for men and women, the endurance and self-sacrifice of women are some of the themes in his stories. In a fine story, Bharyallone Undi, a man hates his wife, Thayaramma, for being too fat. She discovers another girl who is driven away for being too slender. There are yet others who are deserted by their husbands for whimsical reasons. On understanding that the slavish mentality of women is responsible for this tolerance since long, Thayaramma resolves to ask her husband to grow fat like her. Atmagatham shows the problems in hastily contracted / marriages. Prudery and conventional morality have blunted the sensitivity of many people in modern times (Sampenga Puvvu). The double standards of morality which most people apply to men and women is exposed in Bharya Bhartalu. Apadbandhavyam is one of Gopichand’s best stories which depicts the psychology of a woman on a flight. Her fear of an air crash makes her cultivate, rather hastily, the friendship of the man in the next seat. But when the plane lands safely at its destination, she ignores him, forgets the big promises she had made to him in those insecure and intimate moments. An innovative technique used by Gopichand is to present the stories of non-human beings through soliloquies as if they are human. A tumma tree, a banyan tree, and an ox tell their tales in this fashion. Both the trees are vital to the vil­lage economy and even to the cul­tural life of the countryside. When the banyan tree is felled on the orders of an arrogant panchayat president, the tree bemoans man’s ingratitude. But it quickly grows again and creates new life. Some of these soliloquies satirise the indus­trial civilisation which has changed the attitude of people towards envi­ronment. An element of satire is there in other stories also: “It was the centre of Andhra. This means that repairs of the road are few and the ditches many.” (Kalala Baruvu). Gopichand believed that Chalam’s stories contributed to moral laxity. Venkatachalam Pathra concludes with the pungent comment: “In Venkatachalam’s world there is not even drinking water. A delicate sense of humour runs through his stories. The description of the fat Thayaramma, sitting in front of the oven and struggling to bend forward, provokes laughter. The quarrels over a pumpkin and an almond tree are humorously told. Though Gopichand read many European writers, he was not a blind imitator of any of them. His stories have a purpose; they are meant to educate. He had the courage to attack age-old traditions, to expose self deceptions, and to condemn tyrannies of every sort. He ranks among the best of Telugu story writers. 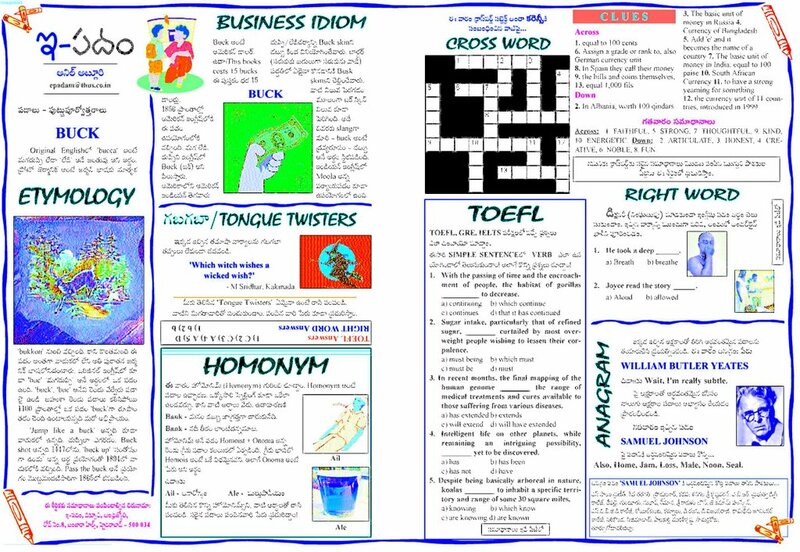 This is ePADAM, perhaps a column, the first of it’s kind that introduces English Vocabulary to the native Telugu reader. Please let me have your comments, criticisms and feedback right now. They are valuable to me. This is what THE HINDU, one of the most respected English news papers of India had to say about his ‘BLACK’ and white contribution. Click on the link and read the story. This is Ravi. Well, that’s the guy with the black hat on. One of my good friends. I know him for almost two decades. He is one guy that proves good friends need not spend time together meeting every day. You could still be good friend though you are living miles apart. In fact I wonder if he knows what I am doing right now. But I know that he would always cherish those days that we spent time together watching movies sharing books, having those cuppa of tea and our friends. It is nice to know that he is growing up and reaching out the skies. The first time I came across his works was a dubbed venison of the film he worked for ‘BOYS’ to be more precise. That work is outstanding. Especially the way he visualized those songs. He had given a new experience to his audiences. I saw the movie more than a few times. I also asked my audience to go watch it. The next time I came to know of him was that he was at that point of time working in the Mumbai films. Though I haven’t seen his work to date. Various reasons. Then I came across an article in the ‘KODAK’ magazine. Was that ‘KODAK’ Ravi? Since then I been trying to reach him. Find his address, an email. What ever. Now “Black’ had happened. I am yet to watch that. I haven’t yet. Knowing Ravi the way I know him and having watched ‘BOYS’, Ravi won’t stop. He has a long way to go and many things to accomplish. And I wish he would take that road to ‘his kinda success’! Atta boy! Keep it up Ravi! 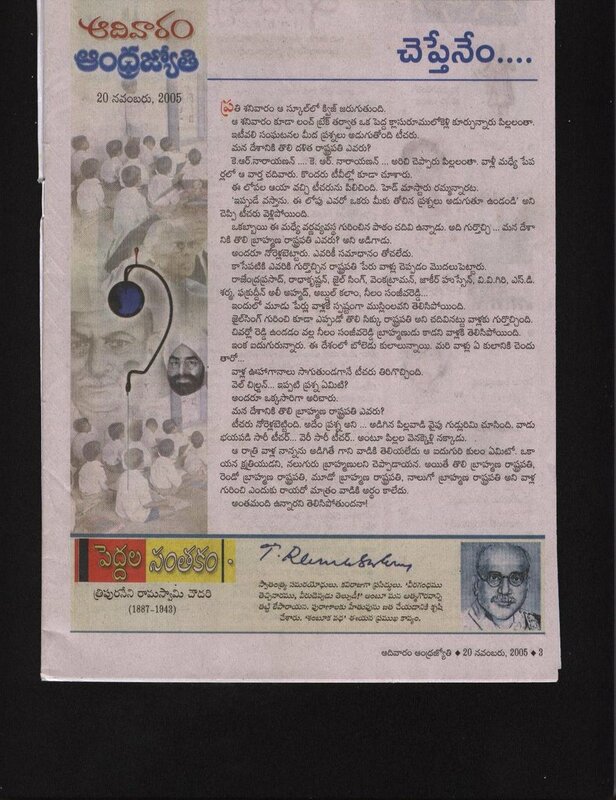 This is the original 16 anna’s Telugu poet, Social Reformer’s signature in his own mother tongue and by his hand available at the Vetapalem library’s (Vetapalem Saraswathanikethan)visitor’s book dated the Twnenty nineth, February, One nine two four! Now what do you have to say..? Author anilatluriPosted on January 30, 2006 Categories Blog, English, Kaviraju Tripuraneni Ramaswamy, TeluguTags ramaswamy, Signature, tripuraneni ramaswamy, vetapalem library3 Comments on Here is ‘Kaviraju’ himself! This is about my own column published in ‘DIKSUCHI‘, a Tuesday book supplement that comes out with Andhrajyothy. For those of you who are wondering about Andhrajyothy, it is a daily news magazine published in Telugu language, a language spoken by more than 8o million people around the world. Andhra Pradesh, is the land of the Telugus, a state in the peninsular India. Who is this ‘Kaviraju’ Tripuraneni Ramaswamy? At the dawn of 19th century a reassessment of the existing cultural values began in India and stalwarts like Ram Mohan Roy, Eswara Chandra Vidya Sagar, Ranade, Dayananda Saraswathi were pioneers of the renaissance movement. In Andhra area K. Veeresalingam, Gurazada Appa Rao and others took it up. Tripuraneni Ramaswamy had been a worthy successor of the great reformers who undertook the task and strove for the spread of new ideas among Telugu speaking people. Tripuraneni Ramaswamy was born on 15-01-1887 in Anagaluru village in the Krishna District of the present day Andhra Pradesh in a family of Agriculturists. Ramaswamy grew up in an agricultural background, but tempered by literary refinement. At the age of 23 he passed Matriculation Examination and in the same year he wrote two plays ÂKarempudi Kadanam” based on Palanadu battle and also “Kurukshetra Sangramam” based on Mahabharatha war. He joined the Noble College at Bandar in 1911 to study for Intermediate Course. In those years he displayed his literary skill and prodigious memory in his Avadhanam. In 1914, he went to Britain and studied law in Dublin. There he studied not only law but also the vast English Literature and the modern European culture. After returning to India he practiced law for some years mostly in Tenali town. But his main activity was directed towards social reform. 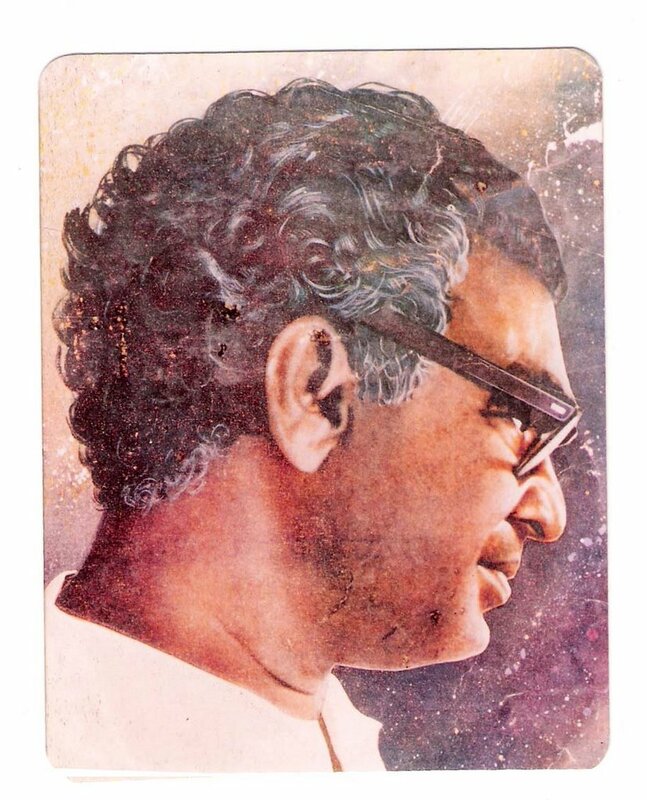 He launched a full scale attack on the caste system and the social injustice which were propagated by Smritis and Puranas and the institutionalized religion. He led the fight against social inequality and inequity. He chose literary writing as the vehicle for expressing his rationalistic thought for the awakening of his people. His famous work SUTAPURANAMM’ in four cantos was a fierce attack on ancient Puranas which were powerful instruments to spread unquestioning faith among the people in custom, tradition, caste system. His inimitable logic and wide range of knowledge displayed in his works is amazing. His poetic work Kuppuswamymy Satakam” reveals the theme of Social Revolution and tells many home truths about social evils, blind faith and indignity to man. In this work he blazed the train which Vemana centuries back heralded. In all his other works such as ‘SAMBHUKAVADHA”, “SUTHASHRAMA GEETHAALU’, ‘DHOORTHA MAANAVA’, ‘KHOONI’, ‘BHAGAVADGITA’, ‘RANA PRATAP’, ‘KONDAVEETI PATHANAM’, he made a rational analysis of dogmas prescribed by ancient classics and the injustice done to people belonging to lower social order and attacked all the discriminating standards advocated by the Smritis. He was a fighter for the upliftment of the down trodden and the hapless. Ramaswamy not only expressed his ideas in literature, he tried to put them into practice. He was against the cumbersome procedure of Hindu marriage resulting in unnecessary expenditure. He prepared a simple procedure in Telugu called,’Vivaha Vidhi”, himself officiated as priest and conducted many marriages. When he was the Chairman of Tenali Municipality he did not permit animal sacrifice to appease Devatas. He fought against the Scourge of untouchability. He was reformer in thought and in practice. Ramaswamy was an ardent patriot even when he was a student, he wrote a patriotic play “RANA PRATAP”, which was proscribed by the British government. When he was studying law at Dublin he wrote to Krishna Patrika, a Telugu weekly appealing to Indians to support the Home Rule movement stared by Annie Beasant. He pleaded for India’s independence. 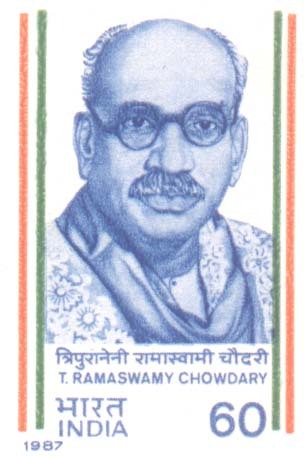 Ramaswamy wrote many patriotic songs inspiring the people to great heights of sacrifice during the independence movement. He was an ardent lover of Telugu language and culture and was proud of their history. He was an educationist and was a member of the senate of the Andhra University for three terms. He was recipient of many honors and was popularly known as ‘KAVIRAJU’, a title conferred on him. This great revolutionary thinker and poet died in 1943 but left his imprint on the development of rational thought among Telugu speaking people. His eldest son Tripuraneni Gopichand had left his own indelible mark on the telugu literature. Ramaswamy’s eldest daughter Sarojini Devi married Subba Rao Kanumilli, an officer of Indian Administration Services known for his ethical standards. Gokulchand Tripuraneni has contributed his literary might to the telugu literature. One of his most famous and outstanding works is in the form of a drama, reflecting the drought of Bengal in the 1950s. Pitcheswara Rao Atluri, a Royal Indian Navy mutineer, during the Indian Freedom movement, married Ramaswamy’s youngest daughter Chouda Rani. She is perhaps the first woman, to run a bookstore exclusively in Telugu language in Tamilnadu the land of Tamils, in the peninsular India. She too contributed to the telugu literature in her own way. She passed away in 1996. Author anilatluriPosted on December 28, 2005 Categories Blog, English, Kaviraju Tripuraneni RamaswamyTags Gopichand, pitcheswara rao, poet, reformer, stamp, Telugu, Tripuraneni, tripuraneni ramaswamy2 Comments on Who is this ‘Kaviraju’ Tripuraneni Ramaswamy?